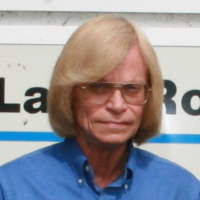 Mr. McElwain, can you check my math and tell me where to find old orifices? 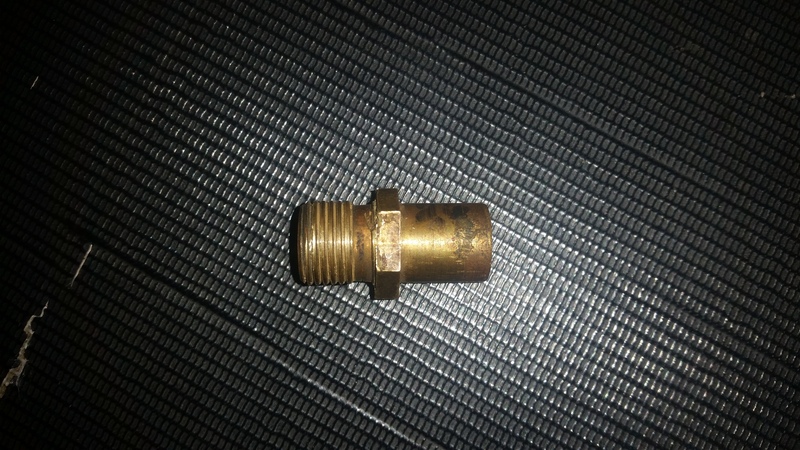 I need to find this orifice (4 of them) and I cannot find a local company who has one, or can find one. 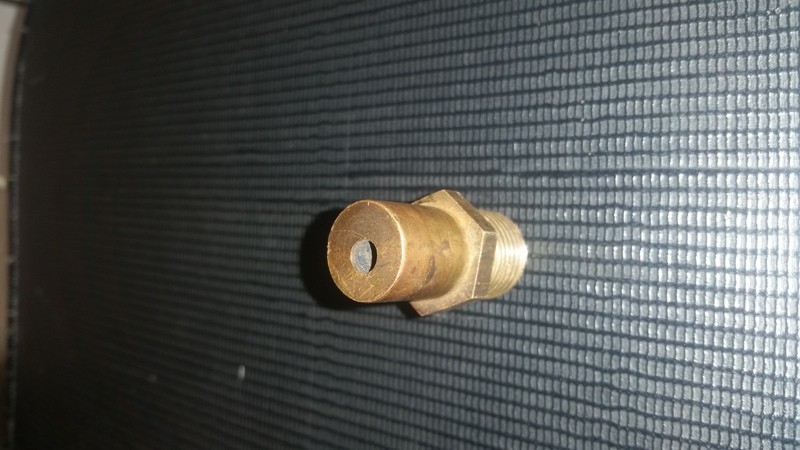 A blank is fine, I can drill it out, but it should be a #26 with what appears to be a 5/16" thread, barrel is 5/8" long and 9/16" wide. Picture attached. This is for an old Climatrol boiler not sure the age, model number: 11W11, serial number: 2 GG. 270000 input 1440 ft^2 water (216,000 btu/h) output. 4 burners, we are at 5300 ft altitude any one who wants to check my orifice sizing? I think a #26 should be correct. Heating a small 5 unit apartment building. Owner wants it to run as well as it can, but does not want to replace it, so we started to tear into the boiler, clean the burners and brush out the sections (wasn't very dirty considering age), replacing the pumps (there are three, all of them are so grossly oversized that when they were all running a conservative estimate based on what I can see for exposed piping and rads they were pushing over 70 gpm through this boiler. I am guessing that the pumps were so oversized they could barely get any delta T across the boiler and the heat took a long time to respond, so someone thought that oversizing the orifices would help the problem and so they drilled them out to #18's. can't fix stupid right? Anyway, I got the burners all cleaned up and the boiler brushed out, new pumps installed only thing I can't find are these orifices. Any help would be appreciated. At 5,000 feet it should work ok with a 27 or 28 assuming 3.5" W.C. with a BTU content per cubic foot of 1,000. That will give about 67,000 BTU's per orifice. As for the orifice e-mail me at [email protected] and I will forward you an Anderson Forrester Catalog, they are located in Colorado. They have all kinds of old orifices available. Tim, I will email you tomorrow morning when I am back at the shop. Thank you so much for your help! While I do not have the altitude for ratings, I am finding# 26 orifice will deliver 54,865 per orifice @ 3.5"w.c. nat gas. (Source Bacharach-training.com/orifice_chart.htm That's one heck of an increase... Take a look and let me know what you think. Anderson & Forrester size guide indicates a #26 @ 3.5" WC to deliver 65,000 BTU input based on NG @ 1050 BTU.
" Approximate Sizes based on average data for all orifice types"
"K Factor .82 " is stated. Neat little calculator they have on their site. If they would just add an altitude parameter, I could actually make use of it. I agree, I like that calculator never used it before. 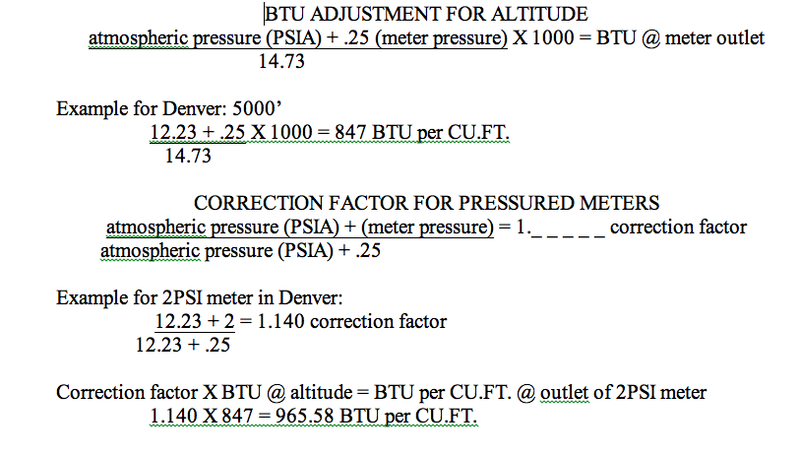 How do others calculate for altitude? I have always used 4% per 1000' above 2000' (so 12% for 5000') for atmospheric boilers and 2% per 1000' above 2000' for mod cons and other powervented appliances. So for my situation, boiler is 270,000 input, less 12%=237,600. divided by 4 burners=59,400 per burner. Btu content of NG here is 950-1000 from what I have been told by the utility. someone once told me it was 850 but I struggle to believe that. So 59,400 / 975 = 60.92 cu ft /hr. according to the chart I have used for years out of an old book, "Gas Water Heating, Cooking and Heating" that indicates 61 cu ft /hr for a # 26 orifice. Thoughts? Is my altitude deration inccorrect? ∆T......i used to live in Glnwd. Spgs.. This is the info I got from the head engineer for RMNG. For atmospheric burners you derate 4% per thousand feet if the altitude is over 2000'. You multiply 4 X 5 in your case. This is because you can't get enough air through the burners. This is the rate you want to fire at. The BTU content of gas changes with altitude because pressure regulators use atmospheric pressure as a reference. When you measure the pressure in a burner in Denver and it is 3.5" WC it's about 2PSI less than the same reading in L.A. so the gas is less dense and has fewer BTUs. This is the formula he gave me. Sorry had trouble with attach. Let's try again. Right -- I have the formulas (and you can usually find the exact number on the gas bill, barring some kind of meter coefficient.) Just thought it would be nice to have it right there in the calculator. 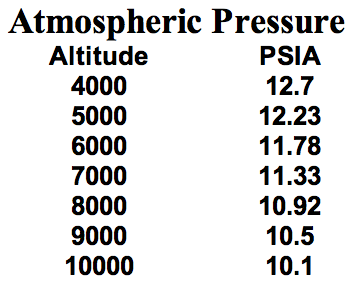 Here is atmospheric pressure in PSIA (absolute) . Ahh, so i should be derating by 20% then. That's what I used to do, then last year someone who I thought knew way more about this than me told me it was only for each additional 1000 above 2000. Interesting. Thanks for the equations, greatly appreciated. Doing a boiler install today, once i get done i will go over these tonight in detail. I guess I would just get the smaller size, install it and clock the meter and check operation. You can always drill larger. FWIW: Every heating gas burner I've seen in 35 years has been oversized. (Even put some of them in myself ) Every oil burner I serviced got a smaller nozzle every year until down to the minimum input. Never had a complaint of lack of heat. These were all eventually changed out to NG, LP or heat pump and that gave me a fair guide how to size the replacement. Also did heat loss/gain and still oversized somewhat. I'm getting them machined at 28 and then we can drill out if need be. Needless to say, the existing 18s are way too big. Excited what the fuel savings will be with the correct pumps (seriously had to be at least 70 gpm through a 270000 btu boiler) and the correct orifices and burn! I will keep you guys posted. Thanks for all the help everyone! I have never seen the btus in natural gas at 5000 ft. over 900 btus per cubic foot and usually less. ASHRAE put out a report in 2006 that stated derating furnaces is not necessary up to 7000 ft.
ASHRAE put out a report in 2006 that stated derating furnaces is not necessary up to 7000 ft.
Really? I'd love to see that. Re-orificing is not necessary for NG most of the time thanks to the physics, but IME the derating is real. I think what's confusing to a lot of techs is that altitude and atmospheric gas appliances is a two part deal. You need to derate the appliance 4% per thousand over 4000", thats the first part. The BTU content of the gas goes down with an increase in altitude because pressure regulators use atmospheric pressure as a reference. That's the second part. It turns out that around 5000' to 6000' the amount you need to derate and the decrease in the BTU content of the gas make it a wash and you don't have to re-orifice. If you go above you will. Well put, @bob. You would have gotten a chuckle out of the discussion I recently had with the head of metering at our local gas utility. We're at 6,000 -- their office is at 5,000. Well, we got the beast back up and running combustion analyzer says 79% all other readings normal for gas fired NG, manifold pressure is at 3.5" #27 orifices (vs. the #18s that were installed previously), 12 degree delta T across the boiler with all pumps running (three total). Don't think it will get any better than that. Thanks for all the comments everyone, greatly appreciated, interesting discussion and I learned a lot. Now that the discussion is finished I just can't resist commenting on the post title: Where to find old orifices? Answer: The nursing home?